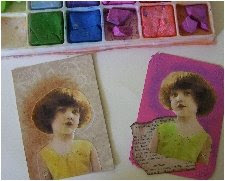 Today I am demonstrating the use of chalks for images that have been printed off on computer paper or you can stamp on paper and use this same technique. Chalks are found in array of colours today with the paper craft industry booming and giving artists another medium to play with. I have several colours to match papers and depending on the effect I want. So enough about that let's get started. Gather some supplies, chalks, some q-tips or cotton buds as some of my UK friends call them, a white eraser, cardstock and some images and some paper towels. 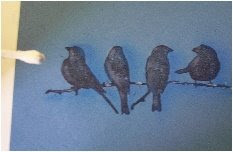 Here I went ahead and applied some images and stamped a grouping of birds in black on blue cardstock. you can either use a lightly coloured printed image or even black and whites work well with chalks. 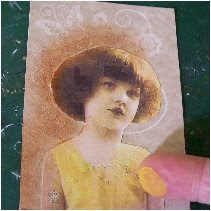 Below I have decided on the chalk colour I am using for this little girl image. 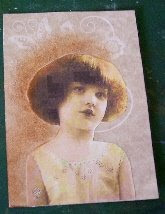 She is on a tan coloured piece of paper so I want to add a shadow behind her and around her head a bit. Now chalks do come with applicators much like eyeshadows but I like getting my fingers right in there plus I actually feel like I have more control where I want to put the chalk.So get a lot of chalk on your finger and lets move on. 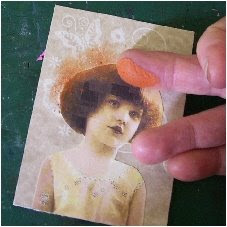 A little tip I suggest, if you glued your image on using a glue stick or glue from a container, make sure the glue is good and dry or the chalk will lay in that wet spot and sort of clump, your eye will catch that if you don't know to do that. Now start with going from the image outward, why you ask? This is because you won't have a hard line where your chalk begins from the outside in. As you apply the chalk move your finger in a circular motion. Notice I am getting chalk on her head? that is ok right now, don't worry that's where the white eraser comes in handy, keep rubbing chalk where you want it and even deepen it if it is not what you are liking. This chalk looks orange here but it is actually a honey brown. Now that you have the area chalked and are happy with it take you white eraser and just gently remove the chalk, I removed it from her hair and I went around the outside and softly blended the chalk making it look more subtle. Now here, the little girls dress is actually a very pale yellow but lets make it more yellow. 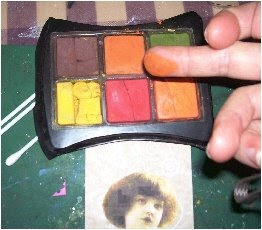 Load up that finger again, just wash off the chalk from your fingers to move onto other colours, or use another finger if you plan to use that colour previoulsy used. Rub that chalk in and if you want it darker then keep rubbing it into the paper. Again clean up with white eraser and just give the image a little blow to remove any unwanted chalk bits. Below here is the same image but reversed on the card and I wanted just to show you the variations of colours you can use. I used a dark purple on the pink card all around the image then her little dress I wanted to use this pretty lime green colour. There really isn't any rocket science to this, you can even use chalks wet but I personally rather use mine dry. Just have fun, be creative, just changing a simple colour makes it look like a whole new image. 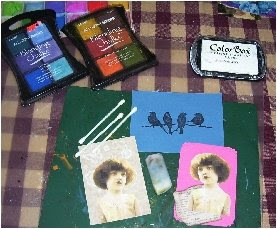 This technique is great for ATC's and inchies too or regular greeting cards. Now here I am showing you a version of chalking but using stamped images. I love this grouping of birds and so lets make that image stand out a bit so it looks like it is coming off the paper. Again do the above method using chalks, this time just chalk either the left hand side or right hand side of all the birds, this is my painting experience coming out, in painting you have a shadow side and a light side. or where the light reflects from one side. I am going to show you here with chalk and a tiny bit of white ink. 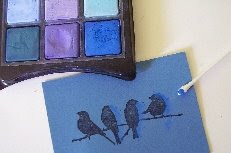 Here I have chosen to use a dark blue chalk against the light blue background and chalk around the birds on the right hand side facing you. Here I used a q-tip to lay down the colour because the space between the birds is rather small. Now rub that chaclk and notice how you see a shadow forming??? at this point make this darker if you like or leave as is. I also applied a bit of chalk below the branch the birds are sitting on. 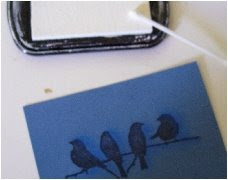 Next, tap a clean dry q-tip into some white ink and then gently remove some of that ink on a paper towel. Next on the left hand side of the birds, just dab a bit of white where their wing might be, the one side of their head or on their tail and skip a bit of white across the branch but not a solid line. That's it, you've just created a chalked image, wasnt' that easy? If you would like to show me some of your cards just email me.